We are continually seeking new and more efficient ways to store items in drawers, closets, garages, basements and freezers. Whether you own an upright or a chest freezer, there are a number of ways that you can utilize the space and find what you need easily. Assign shelves for different products. Divide foods by group. To make locating what you want from the freezer easier, sort the foods into groups such as vegetables, desserts, meats, poultry and fish. Using this method eliminates the need for you to hunt around the freezer for the evening’s menu. Stainless steel freezer baskets at Lowes that fit on the shelves are a good choice too, and then just label the baskets. Use bins to keep like-items together. (Use bins that have holes to allow for air-circulation.) Use different colored bins for easy location: green for vegetables, yellow for poultry/pasta/pork, red for beef, blue for fruit/nuts/desserts. Wrap meats in freezer paper before storing in the freezer. Mark the outside of the package with the item wrapped in the paper, as well as the date of purchase. Rotate the meat by removing the old one that is already in the freezer and placing newly purchased meat beneath it, so that you use items before they go bad. Vacuum seal everything, and do that in the flattest packs so that you can stack them vertically in the bins. This takes up the least amount of space and it’s easy to flip through the items (kind of like a filing cabinet). You can also pound chicken breasts before you vacuum seal so they thaw quickly and are ready to use. In the door you can have boxes of vegetables, jars of home-made stocks, frozen bread, cans of juice, frozen yogurt, popsicles etc that are items needed more often. For refrigerator and freezer labels, I use the 3″ X 1″ plastic hanging tags like the ones in the refrigerated section of the grocery store. You make the labels on the computer and insert them into tags then clip them on the rail of the freezer basket or the door shelves. Use a Sharpie and label the Zip-loc bags. Don’t for get to include the date. New stuff goes in the back, and the old stuff stays in front, until eventually you use it or trash it. This will help save money, time, and not waste food. Once you have your refrigerator/organized keep the same items in the same place so that way when making a grocery list you won’t miss something or but more than what you need. · To maximize your freezer’s efficiency, keep it fully stocked. If you find that your freezer isn’t full, place your ice cubes in a plastic storage bag and stuff it into the freezer. This will take up space and keep cubes handy for parties. · If you lose power, remember that your frozen items can remain edible for up to 48 hours if the freezer is filled to capacity. For a freezer with fewer items, 24 hours is the rule. 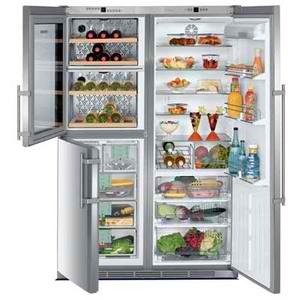 · Clean and straighten your refrigerator each time you go grocery shopping. Toss out any bad or expired items. This will help you see what is good and make space for new items. · Don’t store milk or dairy products in the refrigerator door. That is the warmest spot in your fridge and the items will spoil quickly. · Place leftovers in a prominent spot in your refrigerator, so they are eaten promptly. If you don’t think they will be used quickly, designate a leftover section in your freezer. Every two weeks have a leftover smorgasbord. Remove all leftovers from the freezer, heat them all up and serve a buffet-style dinner.